Emma, after finally noticing that Grant is laying on the couch where she had been quite a bit earlier: "But, Grant took my spot on the couch! I didn't know I fell off the couch. I didn't know I was on the floor!" Daddy: "Grant, do you want to go on more waterslides?" Daddy: "Grant, we could go on the snake!" Grant: "Yeah! The snake, snake snake!" Then, at the top of the slide, "Daddy, this not a snake, this a waterslide!" But he went on it anyway. Grant: "Mommy, it's frinky outside." Me: "Is it really freaky outside?" Emma: "Try to scare me!" Me: "Eat your lunch now, please." Grant: "I'm taking long drink." Emma: "You can't scare me because I'm so brave. I'm the bravest of all. You will never be able to scare me ever." Grant: "Daddy, I have a pee-nus." Marty: "Yes, Grant, you have a pen1s." Grant: "Sissy has a Ji-nah." Marty: "Yup, girls have a vag1na." Grant, looking at the cup of water in Marty's hand: "Daddy, cup no have a ji-nah." Me: "Please don't lick the book." Me: "Please don't lick my hand." Me: "Please don't lick each other." Me: "Do. Not. Lick. The baby." Me: "Please don't lick the grocery cart." Me: "Please don't lick my toes." Me: "No, you may not lick your brother's eyeballs!" Me: "Please don't lick whatever you are licking. Keep your tongue in your mouth!" Have you ever noticed what a strange word lick is? Lick. LICK. Lick. Funny, huh? I am thankful for: My wonderful in-laws, who are always there for us right when we need it. Thank you guys, you are such a blessing to us, you have no idea what your gesture means for our family. We love you both so very much! Grant: (Smiling, feeling no remorse at all,) Grant hit Ben! Well, at least he's telling the truth! Looking forward to: I'm a little bit looking forward to school starting for Emma. She is thrilled, and I know it will be good for her. However, I have been looking at the school calendar, and my life will be even crazier when school starts between PTO, events, and the bus stop. This is really a new chapter in my crazy life. What's for dinner tonight: I haven't decided yet. Maybe something fun that the kids and I can take on a picnic? Marty's doing one of his (many) Fantasy Football drafts tonight, so I am on my own for the evening. Birch Bay, anyone? Missing: Still missing my tennis shoe. And I WANT my tennis shoe. With sandal weather rapidly coming to an end, I really really want my comfy shoes that I can easily chase kiddos in. First of all, I would like to say that I am a big fan of yours. I love your seasons and the great way you make the whole world look different at different times of the year. You do a great job, Mother Nature, and I appreciate you. However, this letter is addressing a concern of mine. I am not sure if this has been brought up to you before, but the timeline of your seasons has been a little... off lately. You see, "summer" is supposed to run from June 21 to September 21. Here we are, almost a full month before summer is over, and I am finding myself sitting in sweats and a heavy sweatshirt. The furnace kicked on this morning, and the kids are wearing their footie pajamas to bed already. I am feeling a bit frustrated at the fact that I need to start considering the usage of socks for my family this early in the year. I do understand that living in the Pacific Northwest does not mean that we have the same weather systems as the rest of the country, and that I need to simply be grateful that it is not raining. However, is it too much to ask that we can still wear shorts and t-shirts in August? I do not think so. So thank you, Mother Nature, for considering my request. Please bring back the sun and warmth as soon as possible. At a recent community event, Emma did a spin-the-wheel thingy and got the chance to take a couple of Karate lessons and learn how to break a board. I know that this is the kind of thing that every kid wins, and is simply a way to advertise the Karate School, but she wanted to try it, so we did. Emma's first lesson was yesterday, and she did great. She really enjoyed it and did well. We were sent home with a practice bag and a new free shirt. The first thins Emma said this morning? "Mom, where's my new kicking shirt? Can I wear it again today?" Sure, honey. She has one more free lesson, and then we will all have to have a discussion to make the decision, Karate, soccer or ballet? I will not over schedule her, so she gets to choose one. Well, she might get to choose. The choice might be made a lot easier if the cost is outrageous. After that, Grandma treated us to McDonalds, and the kids ran off some energy. We didn't let them stay too long, though, as my feeling that fall is coming is making me want to enjoy the out-of-doors as much as possible. We packed the kids up and headed towards home, stopping at Emma's new elementary school to play on the playground. I have been doing my best to give this school the benefit of the doubt. We visited for the first time in the spring, and the "Caution, Asbestos" sign is still hanging in the basement window. Fabulous. The kids ran ahead and started to play. I walked up just as Grant was coming down the slide. And then stopped before he reached the bottom, and wiggled to the side before he got off. Strange, I thought. Then I looked closer. Yeah, that's safe. I sent Marty to look for the storm drain that might be missing a cover, and I moved it off the equipment. A little later, I was following Emma when I saw this. At first I thought it was a new and different way to make a play structure, but then I looked closer. Really, really safe. I am so very impressed by this school. Marty did talk me down, saying that there might have been a group of destructive teenagers that just left, and we missed them by five minutes and there was no way the school could know that these things happened. OK, I'll give him that one, but I think I'll be making a phone call today. We did have some fun, after I told the kids to stay away from the wooden play structure. Once again, Emma loved this sliding-thingy. Grant had a great time on the slides. Yeah, there are a few of them, which is great. Have you ever wondered why, when I post pictures of the kids playing, there are a lot of Emma and Grant, but so few of Ben? Well, most pictures of Ben look like this. The kid is on the move. All. the. time. I did get a good one of him last night, though. And I was so very happy, since I have so few really good Ben pictures. Isn't he adorable? With his cool, surfer-dude hair and his giant eyes, he is going to break many hearts. You know, if he can slow down enough for girls to see his amazingly long lashes. I sure hope they get the playground in good working order before school starts in eight days. I am getting nervous! I apologize for the rambling-ness of this post, but I think it's a good one, so I'm not going to mess with it. Amy and I shot a wedding on Friday, so we had Saturday and Sunday off. Well I should say I had Saturday and Sunday off, since my job involves showing up at the wedding a few hours beforehand, taking a few hundred shots, and leaving before the reception is over to go home and relieve my hubby of the four little darlings that are trying to get away with murder in my absence. At the end of the day, I leave Amy with the memory card, and she puts in another 40-50 hours in editing. She really doesn't have "days off," but it was nice to have the weekend without weddings. Over the last couple of nights, Drew's sleeping stretches have lengthened. I have been able to get one to two consecutive hours before waking with him, and getting that extra sleep cycle has made a huge difference. Woman cannot live on catnaps for years on end. At least not without excessive crankiness and/or sitting at the park and counting heads, and then freaking out about not being able to locate a child, who is in her lap. I went into the weekend recharged and ready. I offered to host a Scentsy party at my house on Wednesday, as I often need a deadline to get things done, and I need to get the house cleaned. Armed with a clear(ish) mind and someone else to entertain the kids, I hit the ground running and set out to accomplish things. Saturday was pretty good, but Sunday was better. Sunday at church, our pastor Grant was talking about the ten commandments. He has been on this series for a while, and yesterday he was talking about Thou shall not steal. Now, I have never shoplifted anything, so i was not thinking I would be convicted by this sermon. Grant(the pastor, not the two year old) brought up a few interesting points of things people commonly steal that we don't really consider stealing in today's time. One of those things is time. We steal time form our employer when we do personal things on company time, like checking Facebook or (gasp!) this blog. Now, I am not saying you shouldn't be reading my blog, but if you are doing it on company time, well, that's between you and God. But you see, I don't have an employer. Well, yes, there's Amy, but that is limited to five to ten hours a week. The rest of the time, I work for me. And I don't pay me really well. However, who am I accountable to? Well, if I believe that God gave me everything that I have (which I do,) and God gave me my kids to care for (which I do,) then my time is God's as well. If God is my boss, how's my work ethic? Do I spend a bit too much time on Facebook, or reading blogs, or checking up on MckMama on twitter to see what she's doing with her four kids? Yes, I do spend the majority of my computer time as time that I am also nursing Drew, but do I push it a few minutes past the time that he is done? And how long does that few minutes turn into something much longer than I planned? I found that thought very convicting. If I am living in God's house that He provided for us, why haven't I finished the many projects that I have started? If Jesus showed up at my front door tomorrow, would I be proud to show Him the 90% finished paint job in the kitchen or the pile of stuff that collects in the corner of the kitchen? No, I would not. But here's the kicker. He sees that every day. I need to do a much better job with what I have been given, and I need to stop using the (justifiable) excuse that I have not slept in three years. I need to get my bum in gear and get to work. Guess what I did this weekend? I finished hanging the curtains in baby Drew's new "room", I finished sanding the dining room and re-painted it, I got three coats of paint in the kitchen above the cabinets (one more to go will happen today!) I did all the touch up painting in the rest of the living room, I re-organized the laundry room and changed the shelving unit so I could put things away, I got all the re-usable gift bags and tissue put in a bin and found a place to keep it, I hung a shelf in the dining room and created a craft corner for the kids. And I'm not even tired. It's amazing what one can accomplish when working for God and not yourself. I gotta get to work. Right now, it's coloring with the kids and talking about whatever's on their minds. And later, laundry and sewing. "We do not lick the baby." "Please do not drive your cars over my chest." "But the cars go on the bumpy mountains!" "Well, that's up to Daddy, but I don't think he is going to want to be the Wicked Witch of the West for Halloween." "Sorry, sweetie, but the cat is not going to go trick-or-treating with us." At the fair: "You can pick any prize you want. Except for a trumpet or a sword." "Do not poke yourself in the pen1s with a fork. That is not nearly as fun as you think it might be." Last night we were all outside. Emma, Drew and I had just returned from the hardware store, and Marty was playing with the twins. They had been using watering cans, so the twins were sans-clothing, but that's the joys of summer. Marty and I were having a deep conversation about rust remover when we heard a scream. Not the scream of a child who is hurt/injured/dying, but the scream of a five year old drama-queen. So we wandered over to see. And to stop the drama-queen before the neighbors, who do not know the subtleties of little-girl screams, could call the police. 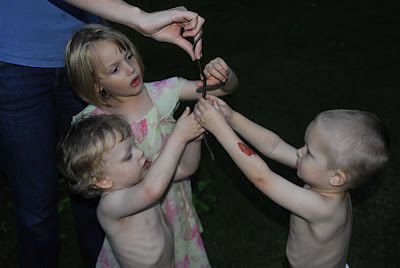 What is a Mom to do when her kids find a snake? 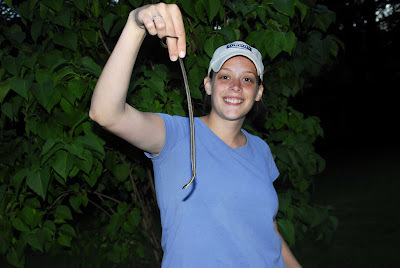 Why, channel her childhood snake-charming days, of course, and play with it. And no, I did NOT photo-shop the spit-up out of my shirt. Sheesh. 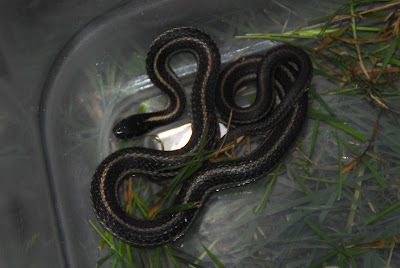 I held it until Marty came back with a bin and the camera, then we let the snake wander the bin a while. The kids Emma decided to name her Princess. No, I do not know if she was really of the female persuasion, snakes are awfully hard to determine, and it really didn't matter. We had a little fun learning about garter snakes. Finally, it was time to let poor, freaked out Princess back into the wild to go home to her family. You can see by the look on Emma's face that she was not thrilled about this idea. "But I will miss her!" "Yes, but she needs to go home. What would you do if you were playing with her and she took you back to her house and would not let you go home to your family? You would be very sad, and scared, and you would miss us. So we are letting her go home, and maybe she will come back to play another time." And where was Drew this whole time? He had fallen asleep on the way home from the Hardware store, and was sleeping soundly in the front yard. 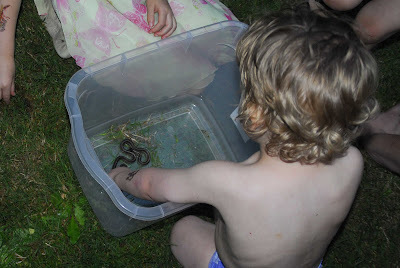 Don't worry, buddy, next year you will be big enough to play with snakes. It feels like fall is right around the corner. Our weather has been strange lately. We went from temps in the nineties and hundreds to suddenly dropping into the sixties and seventies. While the break from the intense heat was lovely, I am more of an eighty-degree girl. I like my summers slightly hot, where shorts and tank tops are customary and we don't get too cold at night. This strange shift has confused a lot of things, not just me. The leaves are starting to turn slightly already, have you noticed that? It's mid-August, for crying out loud! But it really feels like fall is coming soon. And when the first signs of fall arrive, my brain starts going in fall-and-winter directions. I love Halloween. I love dressing up the kids, and I love themes. Some of you long time blog followers will remember that last year, Emma was Tinkerbell, Ben was Captain Hook and Grant was Peter Pan. The year before, Emma was Snow White and the twins were Dwarfs. I am thinking that this year is the last year I will be able to get away with a family theme, as the twins are getting older and will not be so easily swayed next year. I knew what I wanted, it was just a matter of getting everything lined up just so so that the kids would want it too, and most importantly, think that it was their idea. I want a Wizard of Oz theme this year. Part one of my plan was put into action this week. Emma was very sad to realize that her fancy, sparkly dress shoes from last year are too small and need to go to other kids. Perfect timing. I got a copy of the movie from my Mom (who I think got it from my Auntie Helen, thank you, Auntie Helen!) and let the kids watch it. Emma was enthralled, as I expected her to be. She was talking about Dorothy and Toto and being able to sing like her, and I casually mentioned the ruby slippers. "Mommy, they are beautiful! Can I have some like them someday?" And the trap is set. "You know sweetie, if you wanted, you could be Dorothy for Halloween, and then you would get to wear ruby slippers just like her." "Sure, Emms, if you want to, you could. But who would be the tin man?" "Grant could! Hey Grant, do you want to be the tin man?" Grant, who gets excited about everything, "Yeah!" And on and on. Did I mention that I always make the kids' costumes? Now I am on the hunt for ruby slippers (Target) and some silvery-type fabric. Ben has not yet decided if he wants to be the scarecrow or the lion, and Drew will either be the one that Ben does not choose or Toto, I haven't decided yet. But the idea is decided upon, and there is no going back now. This morning, I was on the phone with Holly and I was telling her about the Halloween plan. Grant ran over, so I asked him, "Grant, what are you going to be for Halloween?" He responded, "the witch!" My two and a half year old son has decided that it would be sooooo much better to be Glenda, the Good Witch of the North. Because she's pretty, and she wears orange. Yesterday we went to the fair. And let me tell you, we experienced the fair. We got there at lunch time (very much planned on our part) and hit the McDonald's drive thru on the way. We all ate in the van in the parking lot and then headed in. The kids were thrilled, they very rarely get happy meals so it was a great treat for them. I had packed a ton of water and snacks, so the only food we bought there was ice cream, saving us approximately $239 on fair food. If you think I am exaggerating, you haven't been to the fair with six people lately. Seriously. We had a blast, and the kids did great. Sure, we had our share of not listening and whining, but to think that we went to the fair at lunchtime, stayed out all day, skipped naps, stood in long lines in the hot sun, lost track of time and missed dinner completely- and limited things to one minor Ben meltdown and one Drew fussing episode that lasted two minutes- I'd say we did AWESOME. Yes we stayed late, but after spending $75 on three ride bracelets, we wanted to get our money's worth. We got home a little after eight, exhausted, sore and ready for the kids to sleep in today. Of course it did not work that way, they slept hard but were up earlier than normal. Not the way (or time) I wanted to start my day. Such is life. I'm working on a fair picture post which will be up soon (or next week, depending on how the day goes) and I'm off to accomplish something today. I am exhausted and still sore, but I must tackle a few projects. Have fun! Hoping to sleep well tonight! I have been working on being more patient lately. Do you know what happens when you ask God for patience? He gives you opportunities to practice patience. Today, He gave me a lot of opportunities. Instead of complaining about how things went wrong, I am choosing instead to be grateful for the opportunities. The following are things I am thankful for. I am thankful for whatever wild animal circled our house all night, activating the motion lights so that they were on constantly. This resulted in Patience Lesson Number One, since the kids ALL woke up at various hours in the middle of the night, and seeing the lights outside, assumed it was morning and were very upset when they were told they had to go back to sleep. Patience Lesson Number Two was brought by the storm cloud that dumped rain on our garage sale after I had spent about thirty minutes setting up our tables outside. This gave me an opportunity to rapidly clean up the shop so we could hold our garage sale indoors. And we only opened an hour late. I am thankful for the stupid punk idiot teenager that I saw wandering around the driveway. I positioned myself so that I could see the gate leading into the yard, since he looked a little suspicious. He never tried to enter the yard, but he did have the audacity to carve his name backwards into my shop. I am not thankful for the lesson in patience, however, I am thankful that he was sly enough to not get caught. Because if I had seen him do this, I would probably have been busted for assaulting a teenager. Stupid punk, I ought find you and tell your parents and make you re-paint my shop you moron. I mean, I have a happy heart. And I hope I have more paint that color, or it's going to cost the entire $67 I made to fix his stupid graffiti defacing my property teenage expression of individuality. Wow, it's been a while since I have done this, I keep forgetting when it is Thursday! Don't forget to check out Thursdays with Tiffiny over at The Story of My Life! I'm thankful for: My health. Over the last couple of days, I have dealt with a really nasty case of what I believe to be food poisoning. It has been really hard, but I am so thankful that for the most part, I am generally healthy. I cannot imagine what it must be like to be one of the many parents that live their daily lives with chronic conditions of some sort. I am also very thankful for my amazing daughter Emma, who at the tender age of five, took charge yesterday and took care of the twins while I was curled up in a ball. She even changed poopy diapers and didn't make a mess. I am so proud of her for taking on the responsibility with a happy heart and a willing spirit. I'm listening to: The kids sitting down watching the previews of a movie. Emma just told me, "Mommy! It's the twenty fifth alderversary of Winnie the Pooh! Can we watch that someday, 'cuz I have the book of that but I want to see the movie!" I'm looking forward to: Going to the fair on Monday. I love the fair, and I love the looks on the kids' faces when they see the animals and go on the rides. However, I am not looking forward to the amount of money it is going to cost us to go to the fair on Monday. Yikes. We are having a garage sale tomorrow, for the sole purpose of raising money to go to the fair. I am looking forward to that, too! Have a great day, and stop by for my garage sale tomorrow! But I'm not going to tell you all where I live, because that would not be safe... Ummm... If you are interested, e-mail me and I'll give you directions! Last week, we were out running errands and I changed Grant's diaper in the van. Yes, I know that stores have changing tables and such, but it is soooo much simpler to keep all the kiddos contained in the vehicle, so I keep diapers and wiped and a changing pad under the seat and we do our changing there. I told Grant that I needed to change him, and he responded, "Gwant vewy poopy." "Oh, yeah?" I said, just making conversation, "You are very poopy, huh?" "Yup, Gwant has big poopies!" He seemed excited about it. Good for him. Suddenly, Emma piped in, "Mom, do you know who had the biggest poop of all?" No, and I really don't think I want to know, either... "No, Emma, who has the biggest poop of all?" She looked at me in all seriousness. "God does. God poops bigger than anyone." How would you respond to that? You know, after you have picked yourself up off the parking lot and stopped hyperventilating, since you were laughing so hard? I tried, I really did. We talked about how God doesn't poop, because God isn't a person, He's God. She asked me if I was sure that God didn't poop, and I thought about it. I think it is pretty safe to say that God doesn't poop, but how do I know for sure? Do I google "Does God poop?" and see what Bible verses come up? I love that she is seeking out God and anything she can learn about Him, but I am a little afraid for the questions that will inevitably come up. I am very strong in my faith, but how do I explain my faith to others, especially when they ask the really random stuff? A while back, it was, "Mommy, is God a person?" "No, sweetie, He is God. He doesn't look like you or me, He is just God." "No, Mom, I think he is really a person named God." Maybe I should write a book, "Everybody poops. Except God." We haven't slept much around here lately. So yesterday two things happened to get us all some more sleep. 1. Drew cut his first tooth. Now why wasn't that on my list of possibilities why he has been upset all night? Why did it never dawn on me that my seven-month-old who has been teething for months might actually be getting a tooth?!? And from the looks of it, his second tooth is coming very, very soon. 2. Baby Drew got put into his very own room. And when I say, "in his very own room," I actually mean, "all his stuff shoved in a corner of our room and an old duvet cover hung between us to act like a wall because we only have a three bedroom house for six people." But we do what we can with what we have to work with. And the playpen didn't fit in the bathroom. Last night was our test. We loaded him up with Tylenol and Baby Orajel, and he did OK. I was up with him six or seven times last night, which is, sadly, much improved over the recent weeks. I think as he gets used to having his "very own room" and his teething pains subside (until the next set come in) we might be able to get some sleep around here. I just noticed that the twins are missing. I'll be right back. OK, I just found them in my bedroom cleaning their trains with their sister's toothbrush. Since she cleaned the sink with my toothbrush earlier this week, I'm not feeling too upset. I'm having a garage sale on Friday, and I am no where near ready. I have a lot of work to do, so I'd best stop blogging and get to it. Have a wonderful day! Welcome to Not Me! Monday! This was created by MckMama, because confession is good for the soul. Or something like that. I am NOT dragging and barely coherent because sweet baby Drew woke up every fifteen to twenty minutes last night. As well as the night before. I was NOT up from three to five a.m. trying to settle him, and almost cursing under my breath every time my head would hit the pillow and he would start fussing again immediately. I did NOT tell my sweet, defenseless, seven month old son last night "You want to cry? Well than lay here and cry, because I am not picking you up anymore!" I would NEVER get mad at a baby who only wants his Mommy's love. At one point last night, Drew did NOT say "Mama" for the first time. He did NOT immediately get picked up and held close, and I would NEVER have told him that "little babies that say Mama get cuddles!" I am much smarter than to introduce that thought, since I know in a month or so, it won't be the same rules. I am NOT actually considering making a pot of coffee to get me through today. The only thing that is holding me back is NOT the fact that I have never made a pot of coffee before, and I actually don't know how to do it. I mean, seriously. I grew up just outside of Seattle, there is NO WAY that I do not drink coffee! On another note, I am NOT dreading continuing potty training. This is NOT taking longer than I thought, I did NOT really think that is would only take three days and we would be good by the weekend. We are NOT still far away from being "potty-trained", and I am NOT seriously thinking about taking today off since I am so incredibly tired. Speaking of potty training, we do NOT still have the carpet cleaner out and sitting by the couch, since it is getting used multiple times a day. Last night, the boys were NOT trying to climb on it. Our children are very well behaved, they NEVER do things they are not supposed to! Anywhoo, I had NOT repeatedly told then to get off, but they persisted when I wasn't looking. And then they did NOT step on the power button, firing up the loud motor and scaring the daylights out of them. Marty and I did NOT sit and watch as the now-freaked-out little boys scrambled to get off the giant thing and run, tripping over each other in their haste, never to return again. We did NOT laugh and laugh instead of coming to their rescue. I am NOT pretty excited that I have a couple of blog posts pre-written, since blogging this tired is not good for me, and can produce posts like THIS. Or, worse, like THIS. While we have been on this journey, a few other things have happened around here. Drew is now mobile, he is not doing the traditional crawl yet, but he Army crawls and can get anywhere he wants. He has also discovered how to make cool sounds with his throat, the most commonly used sound is the one where he sounds like he is choking. And then I come running, and he laughs. And yes, I have to come running every time he does it, what mother can ignore the sounds of a choking seven-month-old? Especially one who is newly mobile and has taken to cleaning the Cheerios out from under the couch. So, since he is feeling ignored in this whole potty-training process, he does his little choking-sound, I come running, and he giggles, I leave to finish cleaning up the puddle of pee that one of the boys have left for me, and he does his little choking-sound again. At least I am getting my exercise. 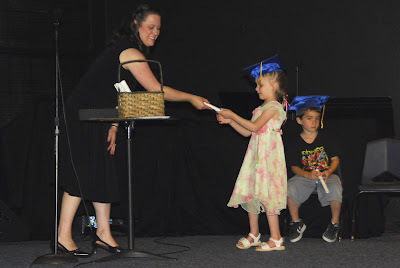 That's right, our sweet angel graduated pre-school last night. She was so proud, the class demonstrated that they knew the Pledge of Allegiance, the days of the week, and the months of the year. We gave her her first bouquet of flowers after the graduation ceremony, and she beamed so big when she realized that they were for her and her alone. When did my baby get so big? She's ready for Kindergarten. I look at her now, so big and smart and beautiful, and wonder where the time went. It makes me sad that it is going by so fast, but glad that she is doing well. I look forward to the future to see what the kids will turn out like. 1. Contrary to what I have been telling myself, the second day is not any easier than the first. 2. You must appreciate the baby steps in the process. And still appreciate these steps the second time that Ben runs to the bathroom, sits down and pees straight through his underwear. 3. Little boys (at least, my little boys) pee about every ten minutes. Logic would say that you should then put the boys on the potty every ten minutes, but it does not seem to work that way. They can sit on the potty for twenty minutes, and then get up, wash their hands, and go out in the living room and pee within 4.2 seconds. 4. Letting your child pick out their own undies is a great way for them to be involved. However, leaving them in the middle of the process to check on the other twin might lead to some interesting choices. 5. It may seem like a good idea to use all the candy that the kids have collected at the many parades they have attended during the summer, but it is really not a grand idea. Most of it is hard candy that will not be fully consumed by the time they pee on the floor again. M&M's are a much better reward. 6. Now is the time to bust out hand-me-down toys. Namely, if the kids have an older cousin who loved Thomas the Train so much that you were given a huge Rubbermaid tote full of tracks and trains, bring it out to use as bribery. It will work so much better than offering yet another hard candy that is slightly crushed from being thrown to the ground from a parade float. 7. Choosing to spend some of naptime to build a really cool train track can help keep the little ones occupied, desiring more trains, and most importantly, off the carpet. 8. If your husband stops by to pick up his phone, sweet talk him into staying to let you take a shower. He might be at your house for twenty five minutes and have to deal with three accidents, giving him an entirely new perspective on the stress that this may cause you. And he might let you hog the computer after the kids go to bed, knowing that if you don't get a little down time you might just scream and run away from home. 9. Having the carpet cleaner out and ready is a great plan. However, making sure you actually have the soap that goes in the carpet cleaner is a better idea. 10. Finding really old carpet cleaning solution in the back of the laundry room, after desperately searching for something that you can use to clean the urine out of the carpet, might actually make you cry. Maybe that one's just me. 11. If the boys once again refuse to sleep at naptime, do not be impressed when you walk by and catch a glimpse of one sitting quietly in his bed. Especially when you suddenly realize that the house smells strongly of baby powder. 12. Remember that someone always has it worse. At least I don't have sextuplets. Thank you for this food, and thank you for our family. Bless our bodies and the hands that repaired it. And please help the boys to not pee everywhere. Amen." Today is day two. Armed with my new knowledge, I am betting it will be a better day. Welcome to Not Me! Monday! 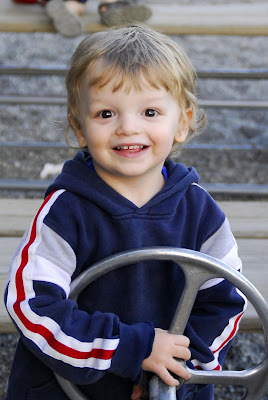 This blog carnival was created by MckMama, who is still with baby Stellan in Children's Hospital. Praise the Lord, Stellan is doing much better and is getting on an oral drug regimen so that he can go home soon! WooHoo! This week our area did NOT break a record for the hottest day ever in recorded history. We were NOT sweating up a storm, and trying to find fun, free ways to not overheat. We did NOT spend a great deal of the time sans clothing, slathered in sunscreen. 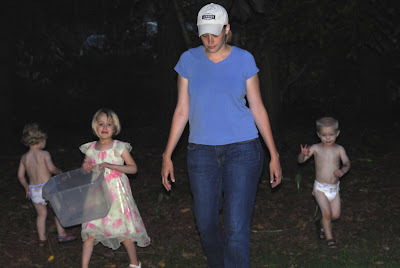 The boys had a blast running through our backyard a field by our house, picking flowers for their Mamma. When it cooled off a little that evening, (you know, down to the low nineties,) I did NOT mow the lawn field in a bikini. Our lives are NOT so crazy that mowing two acres with a push mower really is considered easy and a break. We did NOT share the mowing chore, because we both like it so much. We did NOT spend a great deal of time in the shade with the hose/pool/sprinkler/any water source we could cool off with. Ben was playing with the hose when Marty came home from work one day. I did NOT tell Ben to "Get Daddy with the hose!" I would NEVER encourage my child to do something like that to his fully dressed father. The following sequence did NOT occur, despite photographic evidence to the contrary. The second attack, with the attempt at a shield. We did NOT gather at Marty's softball game to celebrate Poppa Wayne's birthday. Ladies and gentlemen, may I introduce, the REAL King Julian. Who likes to pretend that he does not like having his picture taken. Being the caring, attentive wife that I am, I did NOT get distracted and realize at the very last minute that my husband was up to bat every time, I was ALWAYS paying attention so that I could get a good picture of my husband, including his face. I did NOT have to settle for pictures like this one because I did not get around to the other side in time. Baby Drew did NOT have a grand time with Auntie Holly. We did NOT celebrate Wayne's birthday with cupcakes and ice cream. Ben is NOT rolling the ice cream on his face here. Nope, my boys are gentlemen and they would never do such a thing. See? Grant is a gentleman too, and he does NOT cover his face, clothing, and lap in cupcake, either. Cousin Lily, Emma, and Auntie Amy did NOT enjoy an ice cream cone as well. And finally, I am NOT the luckiest girl in the world with the best friends ever. After this post where I was, umm, whining, my friend Tarah did NOT stop by and pick up all my dirty laundry and wash it for me, since her washer and dryer are in her garage and do not heat up her house. She did NOT return everything clean and folded, making my life so much easier. Thank you, Tarah, you rock! That act of kindness and love really made my week much easier. You are such a blessing to me, I appreciate you more than you know!